The increase of the total number of websites has increased from 1 in August 1991 to over 700 million in 2013. What the above figures indicate is the potential of job availability for proofreaders. More and more websites are being developed and hosted regularly. Hence, the demand for the services of a Proofreader will always be on the increase. Proofreading going through a document and correcting mistakes in grammar and spelling. In addition, it checks for flow of words in each paragraphs and sentences and making corrections when necessary. 1. To become a good proof reader, you should read books that would help improve your use of grammar. 2. Read newspapers and watch to news programs on TV. 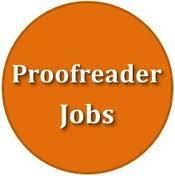 Online proofreading job websites that you can make money with. The following list below are list of online proofreading job websites that you can make money with. – You can work from the comfort of your home and have more time to spend with your family. – You get to select your proofreading tasks. – Working with the internet does not limit your skills to any particular country as internet provides you with international client bases. – You are paid er hour for every completed tasks. Proofreading job creates an avenue for you to be able to work from the comfort of your home and get paid to your preferred payment solution.If you are able to get a job as a proofreader and you deliver your job perfectly in time, you would get more jobs as your client would have more confidence in you adn might also refer others to use you for their tasks. Wow, this is a very good information you have here. Thanks for your post and for sharing this great sites they really work. I like what you guys are up too. Such clever work and coverage! Keep up the terrific works guys I've added you guys to my personal blogroll. I need delivering such every day since it is very wintry my home during the fall/winter season's. I had put together all of these roughly 8 several weeks additionally they also look and feel a bit fresh new. All I have a disadvantage in is that the fur turns into a tiny crispier monthly Cash in wow gold. Some other fool would be that the are starting for you to fold up across, when i really do not prefer. When i continue to enjoy wow gold with the greatest, whilst!! Thanks Christian. I never hired a developer to create this theme. Thanks, I would share more here. Thanks. You just need to learn the HTML code and the basics of CSS to get started. It's Okay Margie so long as you don't forget to give credit. contains remarkable and truly good stuff for readers. I simply want to say I'm all new to blogs and actually savored this web page. Likely I’m going to bookmark your website . You amazingly come with impressive articles. Thank you for sharing with us your website page.